Welcome to the well stocked pantry! Okay, I’m not saying I’m a hoarder but what I’m saying is—I like a well stocked pantry. My sister hoards paper products so it runs in the family. At this very moment, she’s probably got 120 rolls of toilet paper. And I could be underestimating here. But then, who am I to talk, I just bought a case of chicken stock and 14 cans of tomatoes. And more chicken stock is being added to my grocery list as we speak because as a girl heads into football season, there’s two things she can’t get enough of—her favorite SEC team (Go Vols!) and chicken stock. There’s Rocky Top chili and Italian Sub Soup to make, dear ones. I do not want to be caught with my orange and white checkered pants down. Okay, drum roll please. I almost hate to tell you this because every time I tell someone about my chicken stock, they start hoarding it too and then I can’t get it at my grocery store. This is not a word of a lie—I drove to 3 different stores in my little town last week in order to get my chicken stock. Which is why I always buy all they have, be it a carton or a case. Because this brand is amazing. I wish they were paying me to say that, but they aren’t. It’s better than homemade stock, in my humble opinion. It’s dark and rich and full of tasty goodness. I use it ALL the time in almost everything I cook. I get very nervous when the stash gets low. If you ever wonder what to get me for Christmas, you can never go wrong with this chicken stock. Or something from Tiffany’s. Either one is fine. Nut Butters–I have about 5 varieties of peanut butter, almond butter, and of course, Nutella. Nuts–Trader Joe’s has a superb selection of nuts and we keep every kind imaginable on hand. Dried Fruits–I always keep jumbo raisins, dried cranberries and dried Tart cherries for my cherry chocolate chip cookies! Don’t forget the onions, potatoes, garlic, and shallots. There’s no end to the yummy goodness that can be made and shared from a well stocked pantry. Buy in bulk and watch for sales, especially buy one, get one free. I’ve always got my eye out for pantry items that are on deep discount. 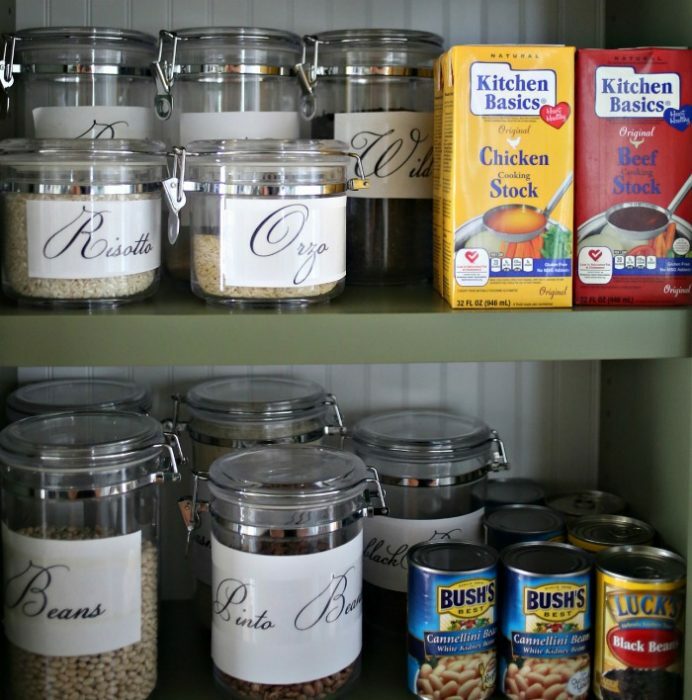 With a well-stocked pantry, you eliminate the first road block to cooking. If you have things on hand, you’re much less likely to give in to the temptation of eating out. Your family will be happy and well nourished with good, home-cooked meals and you will be like super woman. Only without the corset. Click here to print this list! To make the labels, I just print the words I want in my favorite font (Champignon) on card stock or even regular computer paper, cut them to size and then tape them (with packing tape) onto the containers. I usually resize the font to 150 ish to get the size I need. This is a great job for an eager (younger) helper! I got my containers at Walmart and my local grocery store. ps. 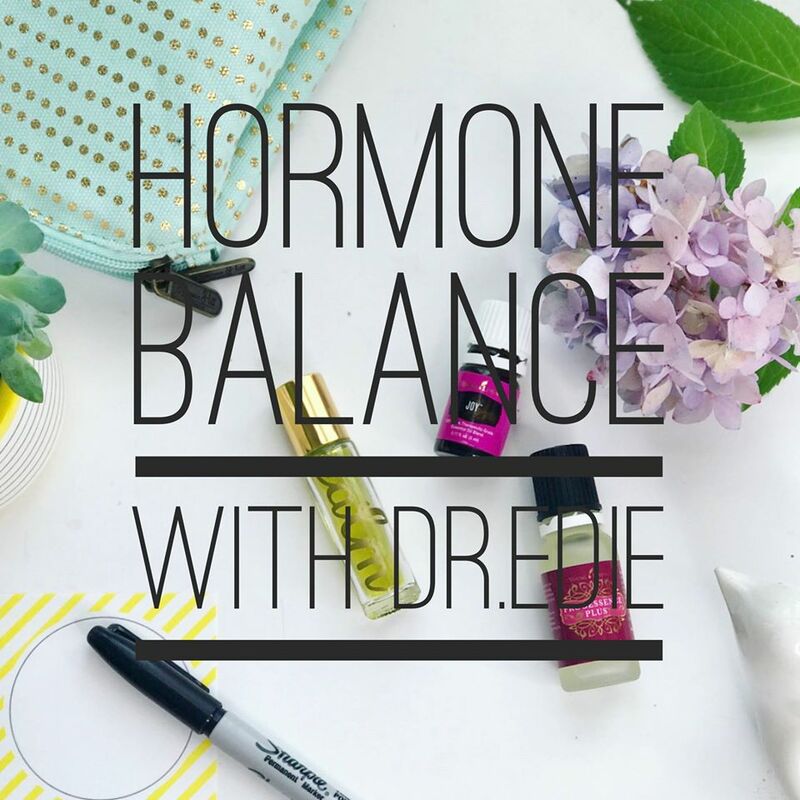 In case you didn’t know, this family doctor took the plunge into the world of natural health and essential oils and these oils are BLOWING MY MIND. 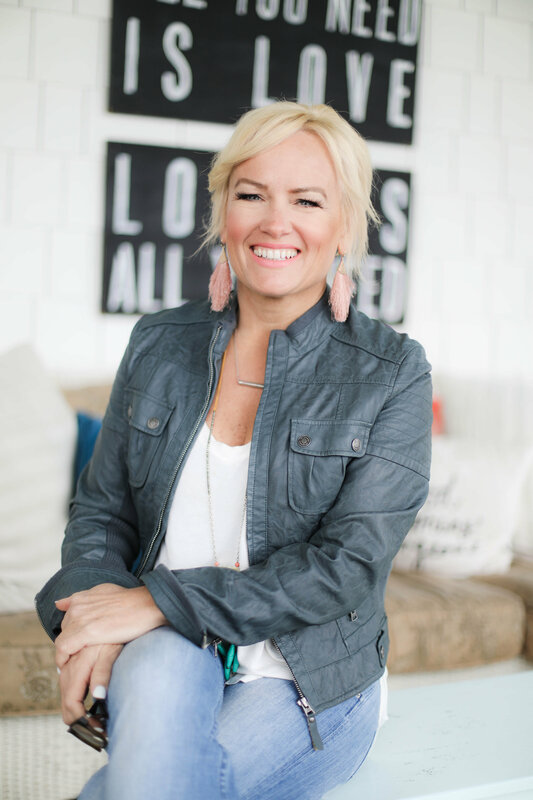 If you want to feel better, sleep better, strengthen your immune system, reduce your stress, and clear some of the common toxins out of your life, I’d love to walk with you as you get started. 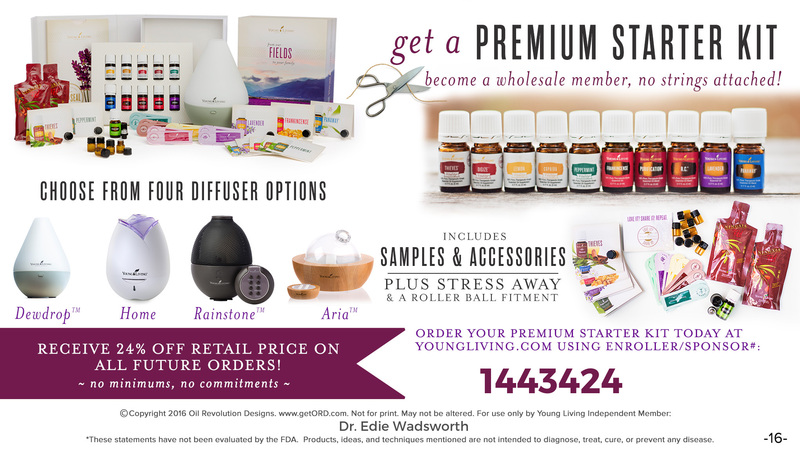 In the month of December (2016) I’m giving away a signed copy of my book along with a $10 product credit (to repay you for the cost of your shipping) to anyone who joins Young Living with me with a Premium Starter kit. Young Living is giving away a free bottle of Christmas Spirit (my ABSOLUTE favorite Christmas scent and SO GOOD for mood!!) with every starter kit purchase. It’s a great time to join!! Click here to read more about it!! Edie, you can buy KB stock at Vitacost.com — they’re not paying me, either, but I’m happy to report their prices are cheaper than my local store AND you can buy in bulk. There’s a free shipping over $49, too. Cases of stock arriving at your door? Hoard on. This is DEFINITELY good news, Jennifer!! oh, no! now Vitacost will be out of my broth (been buying KB and soooo many other things at Vitacost for years) when I want it because of a bunch of hoarders! (like I don’t have a well stocked pantry, myself ;-). That’s my favorite brand too!! I’m down to three and feeling twitchy inside. Happy Fall! 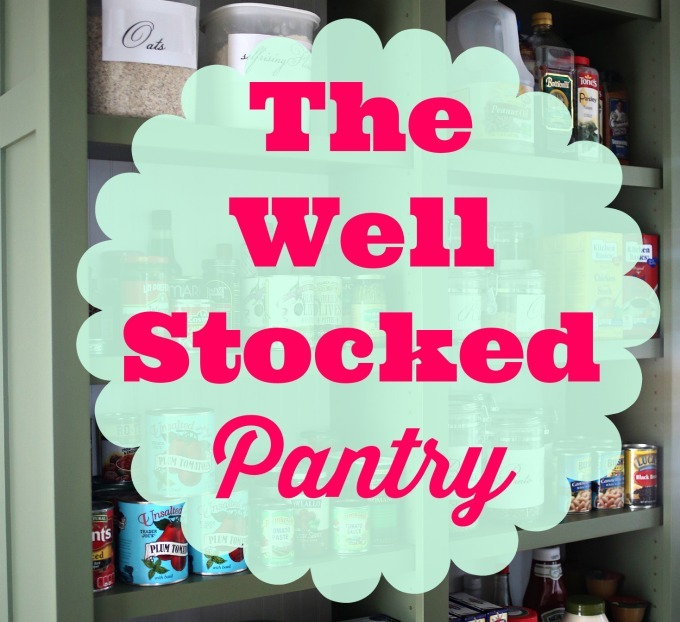 Your pantry is beautiful and indeed it’s well-stocked! What is it about having a well-stocked pantry that makes one feel so richly blessed? A cornucopia on shelves. Ummm, yes, the jar kind and the frozen kind! I’ve never been a fan of canned veggies. Fresh or frozen here. And I always need back up, Richella! I seem to hoard canned tomatoes, of all types. Thankfully the Air Force always packed them anyway, for 21 years. Now that we’re retired from that life and settled in Kansas City, for now, my hoard is bigger than ever. But now that football season is upon us, I’ll be using them up. We’re SEC folks here too, Edie, but of a different stripe: my husband’s from Kingsport, TN, but we met at Auburn University(my hometown) so we’re Tigers all the way! Last year our local store ordered way to much kb turkey stock. So after the holidays it went on sale 2 for $1! I loaded up. Just ran out now back to buying chicken. But have to say the turkey was just as good. So ready for some football, soups and pumpkin everything too! My favorite time of the year. I noticed the Trader Joes plum tomatoes on your shelf. I shop regularly at Traders and was wondering if they would be a good sub for the San Marzano tomatoes you mentioned. San Marzano tomatoes are around 4.99 per can in my area and so can’t afford to used them. The Traders Plum are 1.59 per can, right in my price range. 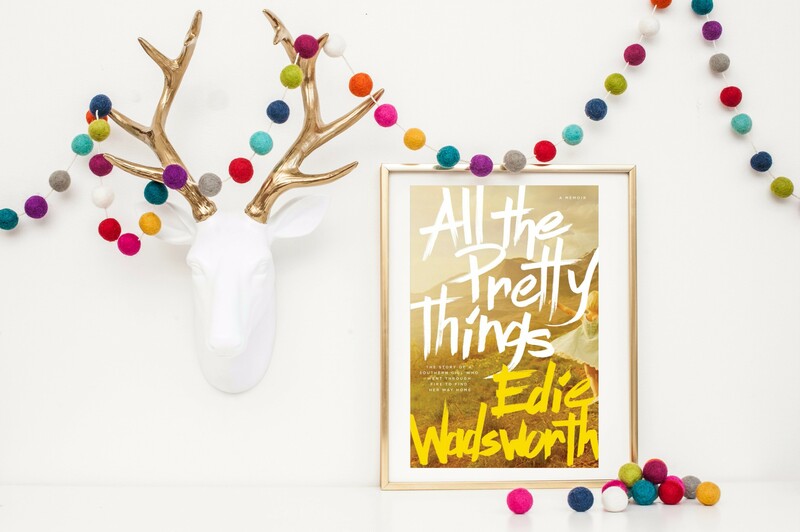 Thanks for all your tips Edie! You inspire me! Yes, I do like them as well! And they’re SO cheap. The TJ’s is an hour away but I get there at least once a month. At times, when I look in my pantry or refrigerator and I have tons of food, either leftovers from entertaining or items to use for cooking I feel like a hoarder…Seeing this makes me realize, it is a gift to my family that 1) we are fortunate to stock our spaces & 2) that both my sweet Hubby and I love to bless our family and friends because we love cook and entertain regularly!!! Working on making homemade sauce, as we speak, with the fresh pickings of San Marzano tomatoes from our garden. Can’t wait! Hope your foot is healing! So cool that you both like to cook! 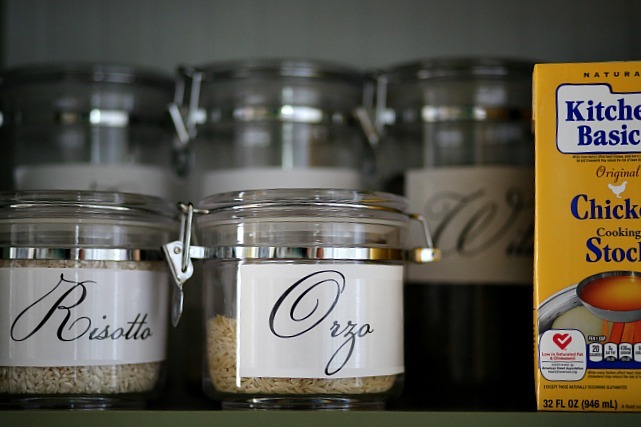 Do you refill your pantry items once a month or just when you use things up? We just moved and I haven’t been able to restock my pantry. Trying to figure out if I should just make one big trip or divide it up. Thanks. THANK YOU for this post! I seriously love all your tips, and I’m just about to start organizing my pantry. So this is perfect! Do you have a blog post on how you organize your spices?? That’s where I want to start because my spices are a hot mess right now! this information to him. Fairly certain he will have a very good read. Edie, I feel like you could feed my tummy until I had a food baby in there and feed my soul with friendship until I burst! 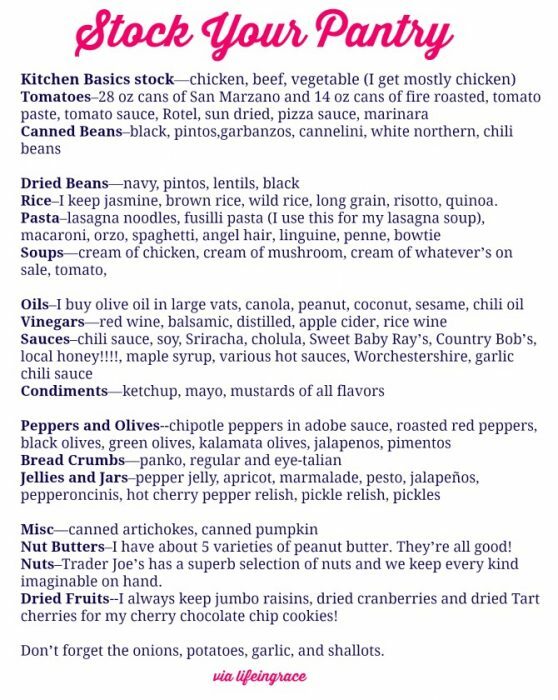 But what I wanna know is, what good lutheran potluck meal can you make with these pantry staples? And, are all your serving dishes labelled for the aforementioned potlucks? I hear ya sister! I have many of the same things on my pantry essentials list, my husband and I are so used to buying 6 to however many we can get our hands on of these items whenever they are on sale, that we ended up with ridiculous amounts of both dried basil and … chicken stock. At one point we had to write, “DO NOT BUY chicken stock” on the bottom of our shopping lists for a few months. Costco has organic chicken broth in a case…..They also have plum tomatoes by the huge can, and tomato paste….I don’t do tomato sauce anymore, I just add chicken stock to my tomato paste….. I am excited for cooler weather too…but we are in CA so we must be patient. I like the organic Kirkland broth from Costco, too! And it’s gluten free, which Swanson is not. OK, girl. I live in your area and now know why I can’t find my favorite chicken stock! I use it all the time and have noticed a shortage. I have your photo, know your basic area of operation and will find you. Ha! Actually, I’m a very good mom and grandma and absolutely love your blog. Glad to know I have good taste when it comes to chicken stock! Go Vols!! I love reading your blog, especially the parts when you say they want to be fed EVERY. SINGLE. DAY. 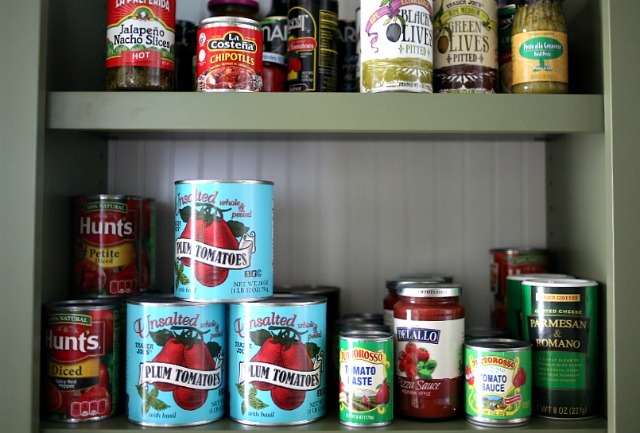 But have you read that the can linings are BPA and hormone disrupters, especially canned tomatoes? (http://www.rodalenews.com/breast-cancer-prevention-diet)I hate to be a downer, but we don’t buy any canned tomato products anymore. We chop fresh romas instead of using canned tomatoes; it takes more time, but we think it is worth it. That’s the brand of stock I use, too. Glad to know it’s got such a good review from you. And I’ve been holding on to the last days of summer with a very tight fist….then I see your pantry and start thinking about cooking chicken and dumplings and chili and pasta fagioli… those are the kinds of things that will get me excited about Fall, but I still have to be drawn in slowly like a crab on a string. limousine, you can start looking at different limousine service companies in your area. Once you’ve made sure that your limousine is reserved, relax. 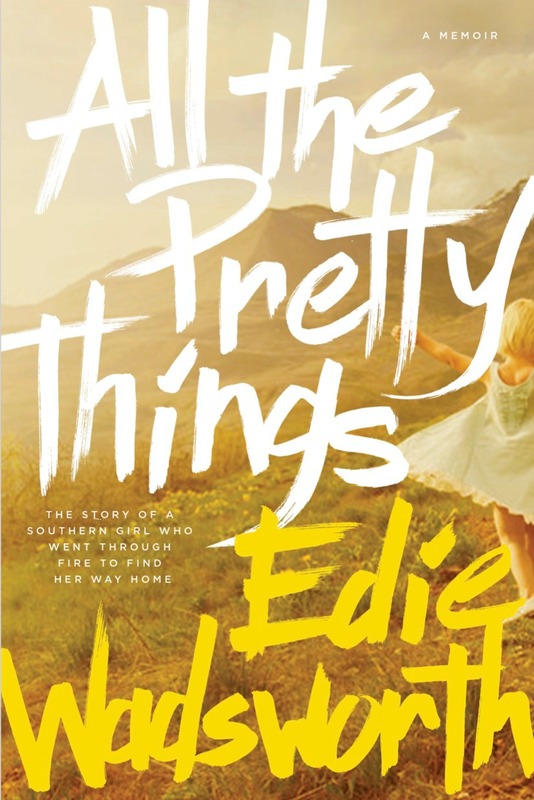 I loved this, Edie. I had to laugh at the grocery store yesterday – I had to hold my 7 year old up to the top shelf to reach waaaaaaaay back for the KP chicken stock. Wonder if you caused a run on it. Thanks for sharing your pantry. The weather just cooled down, the slow cooker is out and pumpkin candles burning. Bring On Fall!! 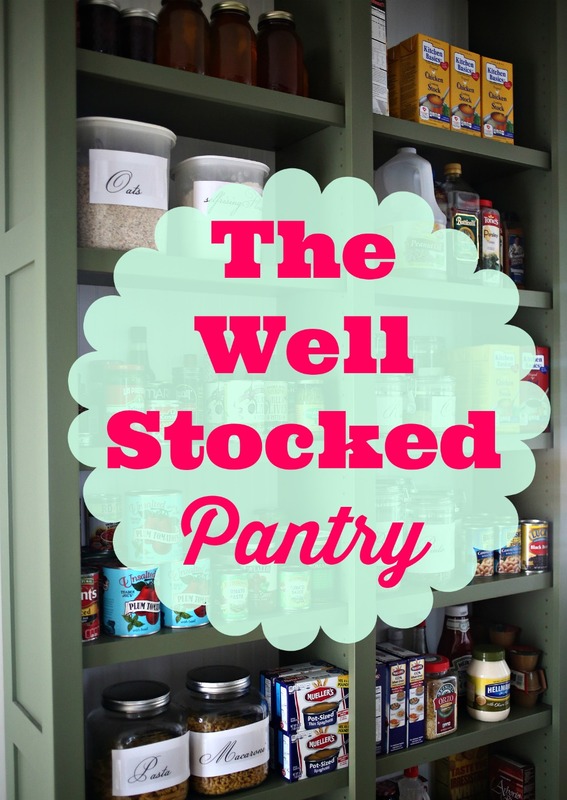 Did you have a secret peek into my almost empty pantry? We do have s’mores makings though! Give me a easy start for a list. Happy Labor Day! 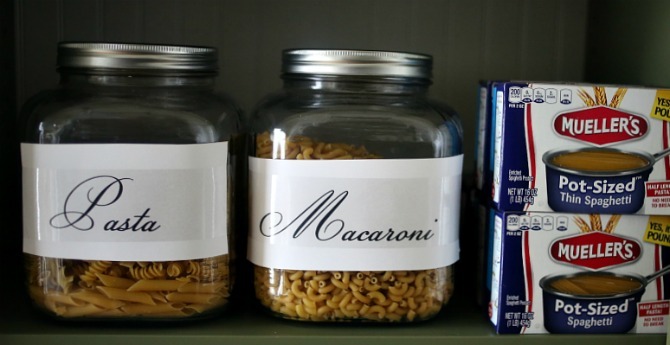 Do you open your pasta when you put it and put in containers? As I noticed in your photo you have them in containers? I know when I buy pasta I just keep in the box, which do you think is better? on three factors: finances, operating atmosphere and security. enthusiasm. Baofeng cb East High Town Zhang Baoli secretary said: “The future will act, give your very best, violin career development for your country to generate greater contributions. Still you can find certain music including country and ethnic music transmitted about the AM band. Baofeng lowyat A number of inventions are related to Lee de Forest, such as triode amplifier, space telegraphy and also the Audion, a different sort of vacuum tube. Hire a publicist – Some charge per hour rate, others charge a monthly fee. So grateful that Christy Jordan mentioned you on her Facebook page today. I love hoarding so I don’t have to do weekly shopping. I laughed out loud about your sister hoarding toilet paper! I am the same way. Sometimes I think I should have stock in a toilet paper company. I so look forward to following you to see what other tips you offer. Thanks for the ideas! My little Kitchen Basics secret is that my Dollar Tree stocks it about 3 or 4 times a year. When I see it there, I stock up!! Pingback: 22 Genius Tips To Help You Cook More On Weeknights | Eat Them All! e-mail subscription link or newsletter service. Do you have any? Please let me realize so that I may just subscribe. Thanks. He was the first to ever realize DMAE’s influence and his products attribute the most recent of effective substances such as neuropeptides and cold plasma.